Searching for a stock that is at the beginning of its bull uptrend is not an easy task. Especially now when the major indexes are getting ready for another run to the sky. When taking into account all available economic aspects of the current market situation, it is still possible although difficult to find trendy stocks with great future potential. 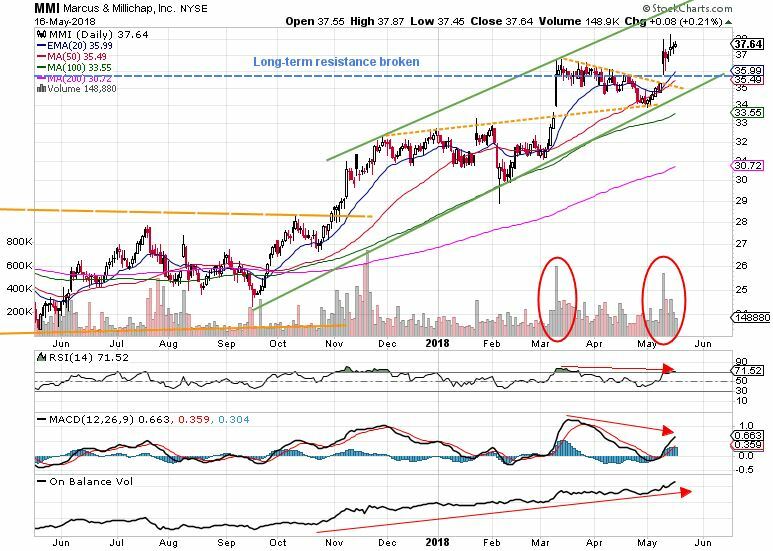 I have just discovered Marcus & Millichap (NYSE:MMI), the stock that looks attractive to both long-term investors and medium-term swing traders. The company is a brokerage firm focused on commercial real estate investment sales, financing, research, and other advisory services. Marcus & Millichap is based in Calabasas, CA. Before jumping to the company’s profile, let’s see how the industry does. As seen below, the Real Estate Management & Development is doing better than S&P500. The industry started to slope up at the beginning of last year and has developed remarkable outperformance compared to the major US index. In addition, it is positively correlated. One year is not a long time – this is likely to last much longer in the current environment. Every market has its cycle – stock market cycle – the most important and first lesson to learn when elaborating a market trend, specifically, four crucial levels to be recognized when analyzing a stock chart. Marcus & Millichap is a great example to show how market cycle principles work in reality. Click on the chart below to see the stock market cycle of the company. At least the last five reported earnings have beaten the estimates. The revenue has been significantly rising on annual basis. RSI – very positive, however, there is a slight bearish divergence, which may cause the price to fix in short-term. 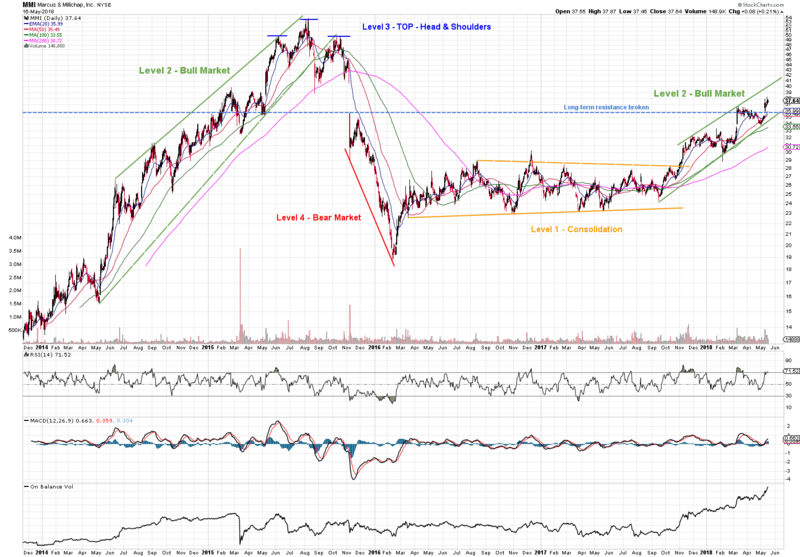 MACD – signal line crossed and entered positive territory. The existence of bearish divergence may force the price to move down within the trend channel in short-term. On Balance Volume – super high and trending higher. Real Estate Management & Development industry is certainly trending higher. Caching the right players soon will result in the exceptional share price increases. Marcus & Millichap is one of such investing opportunities. The important is to stay disciplined and focused on the big picture.